« Jan 1/14 Circumcision of Christ. Commentary on OT readings. The Best Namesday I have ever had. 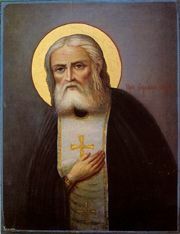 Today is the remembrabce of St Seraphim of Sarov, my patron, and more important to me (and I think he would agree), the first “Children’s liturgy” of our parish. We are undergoing many positive changes in our parish life, which should be no less than living the life in Christ. Since I have been close to a full time priest (translation, I have mostly only one pursuit – pastoral work, rather than juggling full time work and full time pastoral work), we have been instituting many changes. The most important change is that we always have a weekday liturgy, during which we pray by name for all the members of the parish. With the onset of these liturgies, things have started happening. These are not the sort of things that would be profiled on the evening news, but they are powerful and important. All that matters is that we live in such a way that we would know God. The only important role of the Christian, the pastor, the pastor, the husband, and the wife in another person’s life is to help, equip, teach and support a person to know God. Our children’s liturgies are par excellence, an example of our parish’s collective effort to train our children (and ourselves). The first one was way above my expectations. Let me describe it to you. When I was finishing Proskomédia, I heard Jenny’s children come in, and they were excited! Anna was whispering conspiratorially to the pothers “wait until he gets out of the altar!” When I left to cense, they all said to me “many years!”, and their smiles cannot be valued with anything on this earth. Even Lulu (1 ½ ) tried to greet me. It sounded to me like the single word: “gear”. The liturgy went great, short and snappy, as I wanted it to keep the natives from being restless. After liturgy, we had breakfast, with tons of food, brought by no less than five families. After the prayer over the food, the children sang “many years” to me. This is the first time I have ever allowed anybody to sing many years to me in my own parish – you have found my weakness! Near the end of the meal, I talked to the children about making the sign of the cross, and what the three fingers together and the two together mean, as well as a “secret” that none of them knew – why the two fingers are placed in the palm (it signifies the incarnation – God came “down” to earth). We all made the sign of the cross and asked them to show me how to do a poklon (bow), which we all did in front of the icon of St Seraphim . I was pleased to see such enthusiasm. I also talked about what we do when we come in church (venerate the main icons). Everything I talked about I demonstrated and involved the children in doing. After the meal, we had a “story time” with a wonderful book about St Seraphim (“St. Seraphim’s Beatitudes“, available from St Innocent Press – BUY IT!) with beautiful extremely kid friendly color drawings and an icon showing his life. We talked about “Misha” the bear and his ecstasy during Holy Thursday liturgy when he was a deacon, and a few other things. The kids were very enthusiastic and attentive. My fervent desire is to continue these liturgies and expand the participation of the children, and the education we offer them. I am certain that some of them will be able in due time to sing most of the simple responses of the liturgy by themselves. As our group grows in size and ages, we will probably have split groups of kids for education. If God allows, our parish could become an important resource for homeschooling parents, and perhaps Thursday “Children’s liturgies” will morph to include a sort of homecoming cooperative. All things in due time. At this time, we are going to have two “Children’s liturgies” a month – on the first and third Thursdays. They are presently scheduled for 9AM. We will have liturgy, a meal, and then some sort of kid friendly teaching. Let’s see where this goes. Please, if you have any suggestions, experioences, resources. advice – tell us about it! This entry was posted on Thursday, January 15th, 2009 at 5:54 pm and is filed under Events, Local announcements for the St Nicholas parish family. You can follow any responses to this entry through the RSS 2.0 feed. You can leave a response, or trackback from your own site. What a great idea! I really admire your work and wish we were closer to your church.